Richard Musgrave-Evans is a contemporary en plein air realist. He was born in Melbourne in 1968 and grew up in Sorrento on the Mornington Peninsula, Victoria. Richard is a self-taught, full-time professional artist living in South Australia, Australia. He works direct from the subject, whether painting a landscape or still life. The primary aim of working from life is to find accurate pictorial equivalents for what may be seen in nature by painting direct from the subject. Recording a fleeting moment, with true colours and light effects as opposed to the construction of a traditional studio work. The challenging conditions of heat, wind and changing light in the landscape is demanding but there is an immediate freshness of observation and application in Richard’s work which is highly fulfilling for both the artist and for the viewer. Richard stands before nature, en plein air, and honestly conveys its complex beauty for others to enjoy. The excitement of being directly before the subject and attempting to relay it to the canvas, as quickly as he can, gives Richard’s work a freshness and feeling that deals largely with the beauty and wonder of the perceived world. Together with his rich palette and dramatic application, his work is both outgoing and celebratory in character. His work is represented in galleries across Australia and in both corporate and private collections.Richard Musgrave-Evans is a contemporary en plein air realist. He was born in Melbourne in 1968 and grew up in Sorrento on the Mornington Peninsula, Victoria. Richard is a self-taught, full-time professional artist living in South Australia, Australia. His work is represented in galleries across Australia and in both corporate and private collections. Richard Musgrave-Evans is a contemporary en plein air realist. He was born in Melbourne in 1968 and grew up in Sorrento on the Mornington Peninsula, Victoria. Richard is a self-taught, full-time professional artist living in South Australia, Australia. He works direct from the subject, whether painting a landscape or still life. The primary aim of working from life is to find accurate pictorial equivalents for what may be seen in nature by painting direct from the subject. Recording a fleeting moment, with true colours and light effects as opposed to the construction of a traditional studio work. 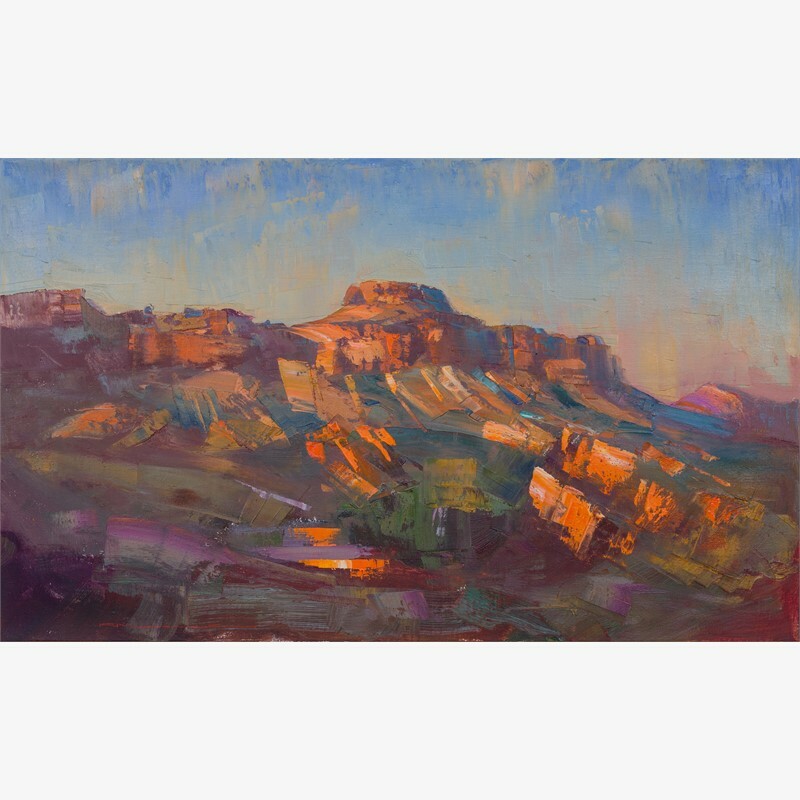 The challenging conditions of heat, wind and changing light in the landscape is demanding but there is an immediate freshness of observation and application in Richard’s work which is highly fulfilling for both the artist and for the viewer. Richard stands before nature, en plein air, and honestly conveys its complex beauty for others to enjoy. The excitement of being directly before the subject and attempting to relay it to the canvas, as quickly as he can, gives Richard’s work a freshness and feeling that deals largely with the beauty and wonder of the perceived world. 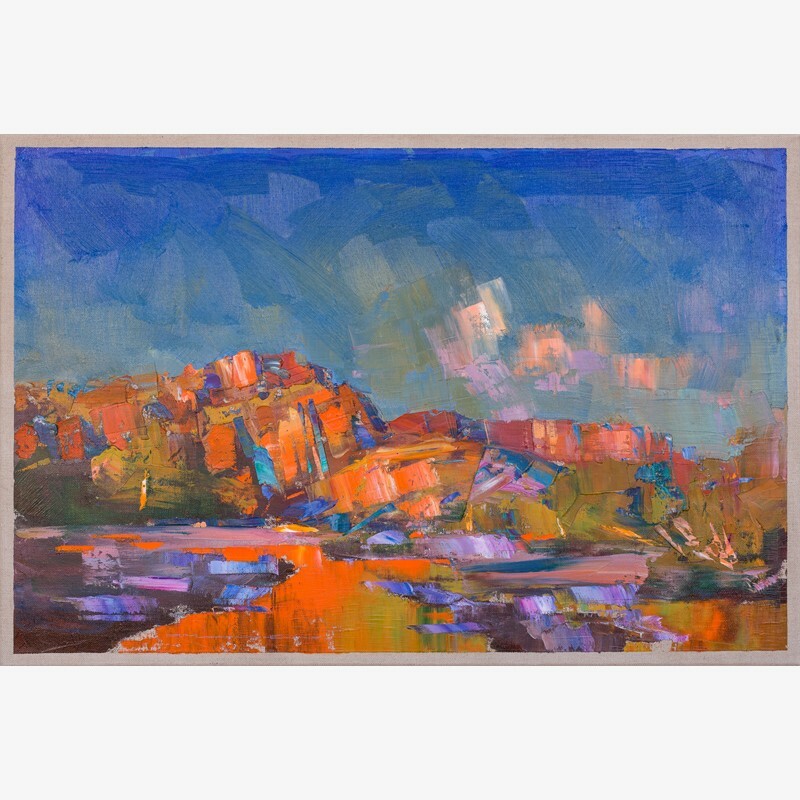 Together with his rich palette and dramatic application, his work is both outgoing and celebratory in character. His work is represented in galleries across Australia and in both corporate and private collections.Richard Musgrave-Evans is a contemporary en plein air realist. He was born in Melbourne in 1968 and grew up in Sorrento on the Mornington Peninsula, Victoria. Richard is a self-taught, full-time professional artist living in South Australia, Australia. He works direct from the subject, whether painting a landscape or still life. The primary aim of working from life is to find accurate pictorial equivalents for what may be seen in nature by painting direct from the subject. Recording a fleeting moment, with true colours and light effects as opposed to the construction of a traditional studio work. The challenging conditions of heat, wind and changing light in the landscape is demanding but there is an immediate freshness of observation and application in Richard’s work which is highly fulfilling for both the artist and for the viewer. Richard stands before nature, en plein air, and honestly conveys its complex beauty for others to enjoy. The excitement of being directly before the subject and attempting to relay it to the canvas, as quickly as he can, gives Richard’s work a freshness and feeling that deals largely with the beauty and wonder of the perceived world. Together with his rich palette and dramatic application, his work is both outgoing and celebratory in character. His work is represented in galleries across Australia and in both corporate and private collections.